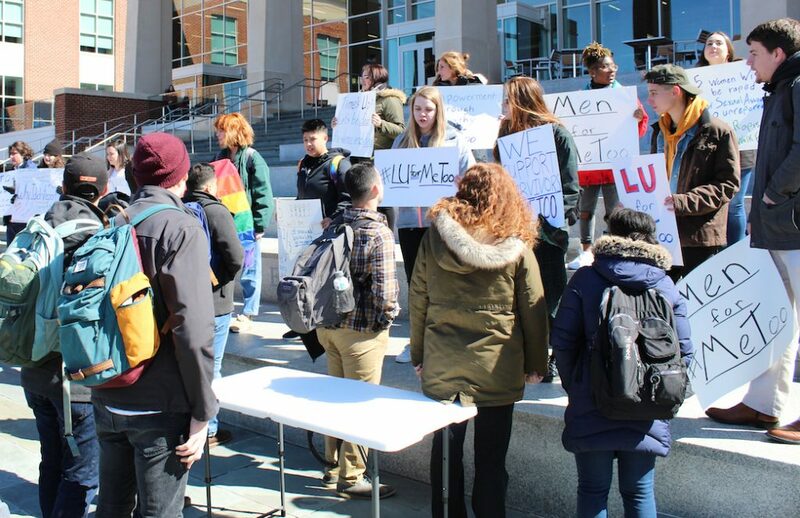 Between 20-30 Liberty University students organized a #MeToo and LGBTQ+ demonstration on Liberty’s campus March 6 in response to comments made by President Jerry Falwell Jr., Becki Falwell and Donald Trump Jr. at CPAC March 1. Some Liberty students and members of the community believe these comments to be transphobic and offensive to sexual assault victims. 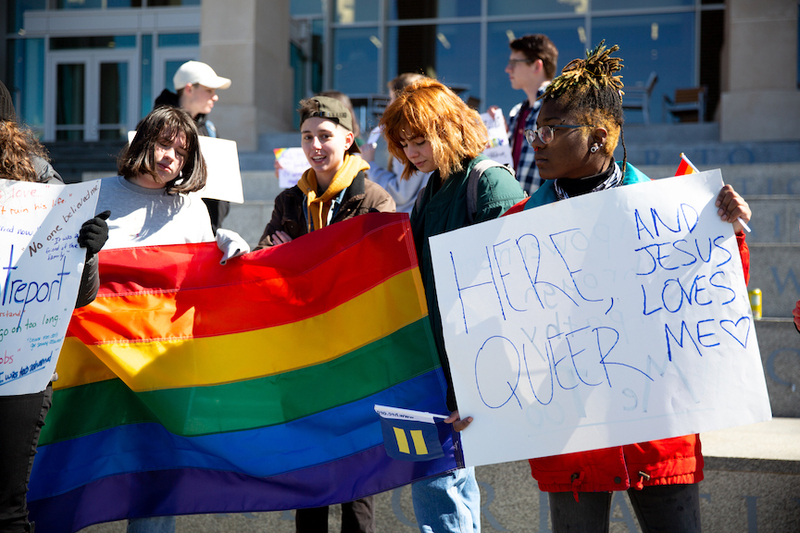 While some protested the treatment of LGBTQ+ students on campus, others demonstrated their support for the #MeToo movement. What started as 11 demonstrators on the outside steps of the Montview Student Union at 11 a.m. gradually increased to around 25 by 1 p.m. The crowd did not exceed 30. Students engaged in peaceful discussions. The demonstrators did not yell or chant. 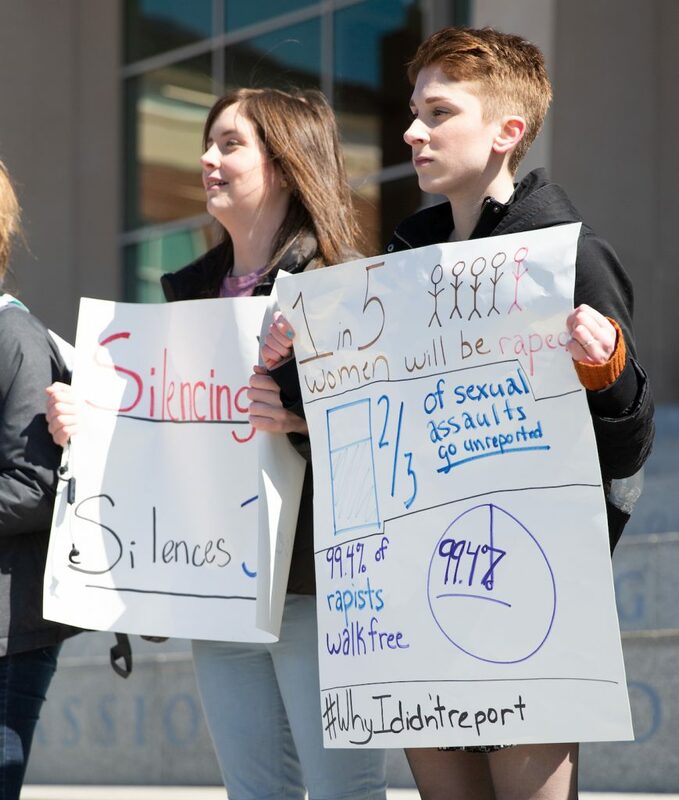 According to Liberty senior business student Caleb Fitzpatrick, who participated in the demonstration, the event was designed to raise awareness for victims of sexual abuse. “At the end of the day, if one student sees this and feels welcome … it was all worth it,” Fitzpatrick said. Vice President for Equity and Inclusion and Chief Diversity Officer, Greg Dowell, said Liberty works very hard to make every student, faculty, staff and for that matter, even visitors to the campus, that do not necessarily agree with the university’s mission or doctrinal statement, feel welcome. 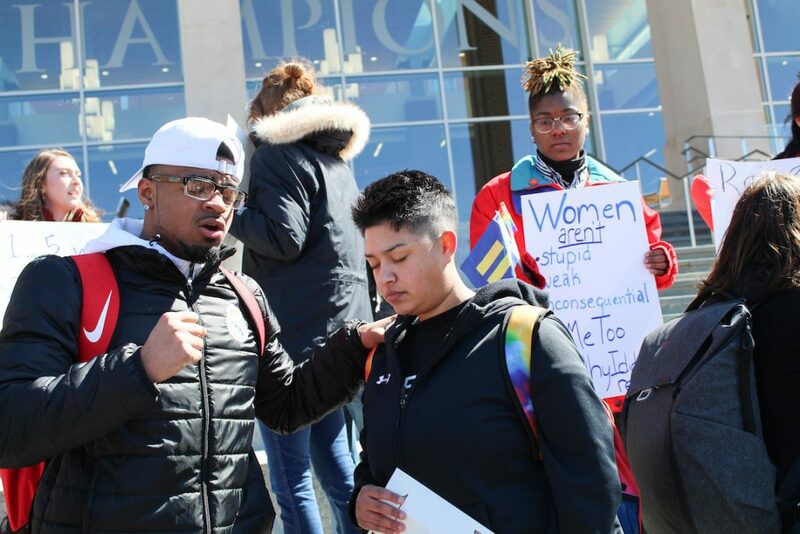 Dowell said though his door is open for students to engage in dialogue with his office about these matters, he is not aware of any such contact that has been made yet by the organizers of Wednesday’s protest — and he invites them to do so even now. Students stretch a pride flag during the LGBTQ+ demonstration. The gathering was comprised of different groups, including the LUforMeToo group, who exclusively demonstrated the importance of believing women who come forth with sexual assault allegations. Becki Falwell’s comment about raising her granddaughter as a girl during CPAC prompted several pro LGBTQ+ students to gather. Following Becki Falwell’s statement, Trump Jr. referenced #MeToo while discussing guns with Falwell Jr, using it in a context separate from its origin. Demonstrators held signs and engaged in peaceful discussion to raise awareness for victims of sexual abuse. Later in an interview, Becki Falwell referenced Prince Harry and Meghan Markle’s announcement of raising their baby gender neutral, saying it was unhealthy for the baby. Becki Falwell’s CPAC comment stemmed from her position that parents should raise children according to their biological gender, not force them into both gender roles early on. Becki Falwell told the Champion she reached out to one of the protestors and engaged in productive conversation about the issues. 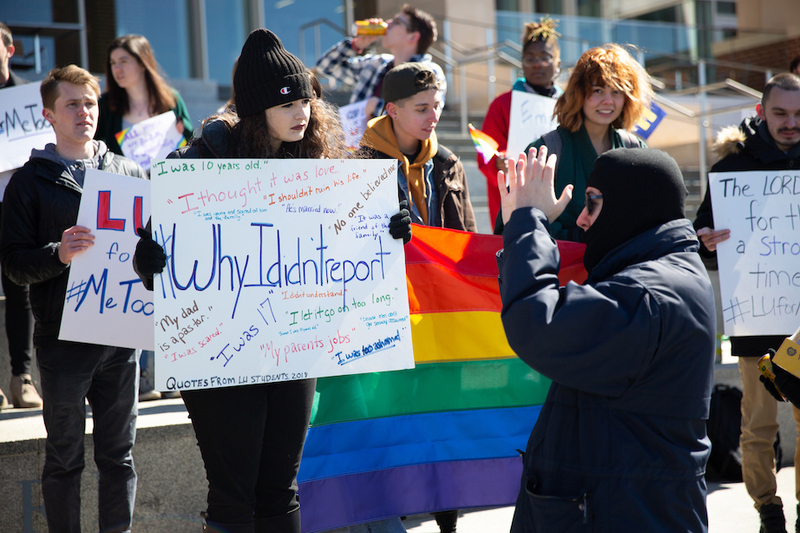 Some student spectators had differing opinions, particularly regarding the pro LBGTQ+ signs and the bright gay pride flag stretching across several demonstrators. Some of the LGBTQ+ signs contained Bible verses. According to junior Bethshan Serosh, who spent almost an hour conversing with different demonstrators, the LBGTQ+ lifestyle contradicted absolute truth taught in the Bible. Another student spectator, Hannah Bremmer, appreciated that students expressed their concerns. Although most demonstrators were Liberty students, some were visiting Liberty Mountain. The demonstration started with 11 participants. Among the visitors was Rev. Ashley Easter, an ordained minister through the Progressive Christian Alliance. Sophomore Levi Link, another spectator, expressed his theological concerns with the demonstration. The gathering ended at 3 p.m.
Students pray together at the demonstration. Evidently you no longer need to be a true Christian to attend Liberty. When I attend 71-75 you had to give a written testimony of your faith and walk with Christ. Not sure that still is required but there is no way a metoo and LGBTQ protest would have happened then, because people associated with those movements wouldn’t be attending classes at Lynchburg Baptist college. So sad to see this in the school where I graduated from in 1997. There use to be standards there and it was Christian. Now look what has happened. God help this school and JL Falwell needs to repent. Allowing such sinful activity. I truly hope that LU does not sway from its guiding principals under God and its founder, Jerry Falwell Sr. When I was a student there in the late 80’s, if anyone was found to have engaged in homosexuality they would be expelled. I see signs like the woman in another photo on this story which read “Here, Queer and Jesus loves me” (if she was even a student) and I have to wonder if LU is slipping away from those principals just to appear more tolerant. I couldn’t do everything I wanted to do at LU. I wanted to grow long hair as a guy, but I would be reprimanded every time it touched my collar! But I respected the school’s rules, knowing that I had a more important motive in attending the school. I’m not saying be tyrants…slacking in dress code a little is no big deal. But when LU begins to accept things that aren’t Biblical, it’s time to reevaluate what’s going on there. I don’t know all the “do’s and dont’s” there anymore, but I fear that the erosion has begun even if it’s small yet. There is no harm in expelling students who don’t comply with the school’s vision and purpose. As much as Jesus loves all people, many will not enter the kingdom of heaven, sadly. It’s better to be right than to conform. Hi Charles- Where is it written in the Bible that homosexuality is a sin? Also, I noticed that Liberty didn’t have a problem welcoming an admitted sexual assaulter to deliver a convocation in September 2017. Do you see any problems with that? Could you see any conflict with your school’s charter by giving someone like that a platform? I can give a reference to that sexual assaulter’s clear admission of guilt if you need me to provide it. Bottom line, here, is that, for the time being, Liberty University, being a private university, can promote whatever world view it wishes to promote much like the other private colleges and universities often do. Liberty does not have to admit anybody – in the United States college attendance is a privilege granted NOT a right which can be demanded. If these students (and I wonder if they are actually Liberty students or if they just managed to get admitted for the purpose of this sort of activity) do not like Liberty University then they need to leave and go to college elsewhere more to their liking. There are plenty of other colleges and universities where what they are doing will be supported. I don’t think the Falwells expressed any intolerance in their comments. Cultural Marxists have convinced people that not condoning or glorifying people’s behavior is to be intolerant. While CHRISTians accept sinners and their may be LGBT at Liberty, the Church is here and Christ is here to lead sinners to repentance and a relationship with Christ. Liberty, I believe, is a safe pace for all despite lifestyle, but do not expect the believer to condone the sin. We can and should disagree when we know TRUTH. However, we are to only judge fellow believers (in love) and lead the non-believer to Christ, if they choose to accept Him! Then we pray if they do not! While I dont agree with every cause or every stance the demonstrators were there supporting… it is great to see students, faculty, and others from both sides of the aisle able to speak calmly and have productive discussions about difficult issues. No riots, no swearing, no ad hominem attacks. Good for everyone on both sides. Becki Falwell is correct, God’s Word is Truth. God created us Male & Female and for me that settles it! I sure hope this situation doesn’t change LU into a Liberal school. Please continue to stand with the late Dr Jerry Falwell, Sr values for this Christian University! I helped support him and this school with my $10 – 20 dollars as it began and I certainly don’t want to see it destroyed by young liberals. I prayed my twin granddaughters to come there & they hopefully will graduate this May. Looking forward to graduation! I don’t think the Falwells expressed any intolerance. Just not condoning or glorifying people’s behavior is to be intolerant.